I keep my house on the cool side and we can never have enough blankets! I saw an idea on Facebook to crochet a blanket one line per day using different colors for different temperatures. In the end you have a pretty Temperature Afghan that represents the whole year. It seemed fun and I’m always up for something that involves buying new yarn! Aside from the original inspiration that’s where the similarities end. The more I thought about it the less realistic it seemed to me. I wasn’t crazy about the strip idea. Figuring out how wide to make the blanket and how long it would be was more than my coffee-deprived brain could figure and I tend to be slightly obsessive about proportions. I was also afraid I’d end up with a too-narrow 30 foot long blanket…. Easiest solution? 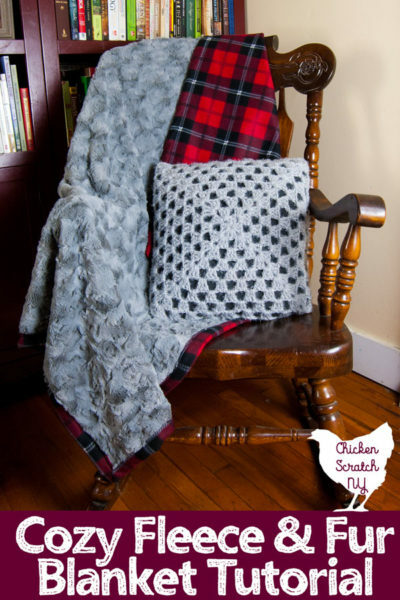 A granny square, working from the center out, treating each side of the square as a different day will yield a square blanket. I actually split mine into 4 granny squares, I’ve only completed 1.75 of the 4 so far. Because I have the focus of a goldfish. 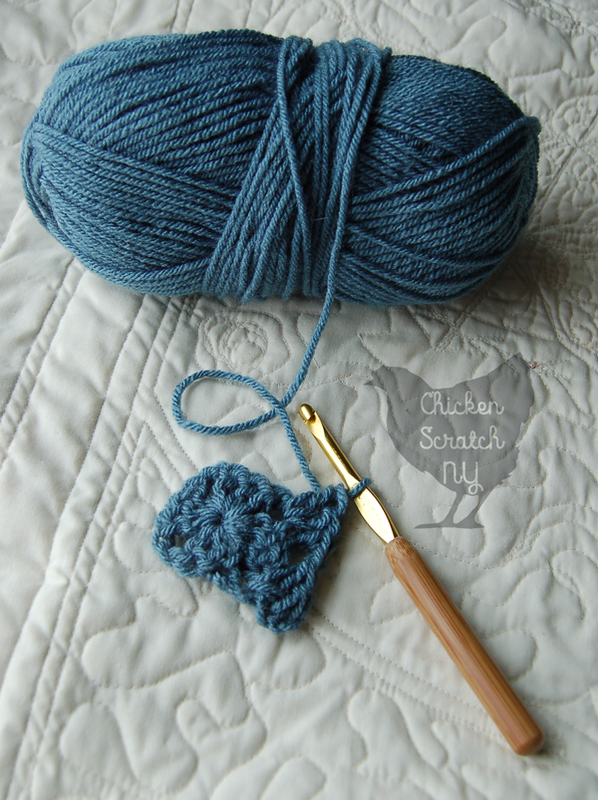 Smaller squares work up much quicker and in the end you’ll use less yarn so it’s cheaper too. Granny squares are awesome because the ‘complicated’ part, if you can call it that, is all in the set up. After that you just follow along with what you did before and you don’t even need to count that much! I’m doing a super simple granny square, I think the random color changes will keep it fancy enough and I need to be able to switch colors easily in the corners. It’s all worked in my favorite stitch, the double crochet. 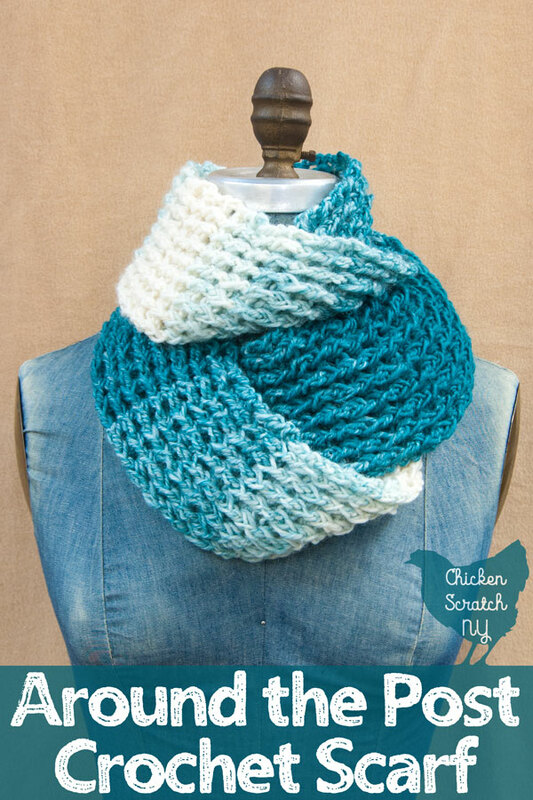 It’s the same stitch I use for my simple double crochet scarf and my around the post crochet scarf. I treated the center motif as ‘Day 1’ and from there I’ve been treating each side as it’s own day. We’ve had pretty steady temperatures so far and I’m still on the same color but the forecast looks a little different for the next week so maybe I’ll get to put my dusty blue aside and pick up a new color. 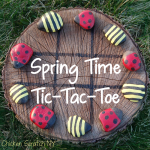 If you aren’t familiar with the basic granny square or you just need to brush up on your skills check out this tutorial from Hop Skip Jump. The only thing that’s a little confusing is the corners if you need to change colors. Traditional granny squares work a whole corner first (3 dc, 3 chain, 3 dc) but since I might have to switch up my colors at a corner you need to cut the yarn at the end of each row instead of carrying it up. When you start a new row you’ll do half the corner, (3dc) continue to the next corner and do half. If you’re sticking with the same color finish the corner and do the next row and half a corner. If you have to change the color it’s not a big deal because you will hide your color change with the next row of colors. The original Facebook image was all bright rainbow colors. That’s not me at all, I need jewel tones and dusty colors. I went with 9 muted tones from the Vanna’s Choice by Lion Brand line. Mostly because it was on sale, but also because I was able to find 9 cohesive colors. 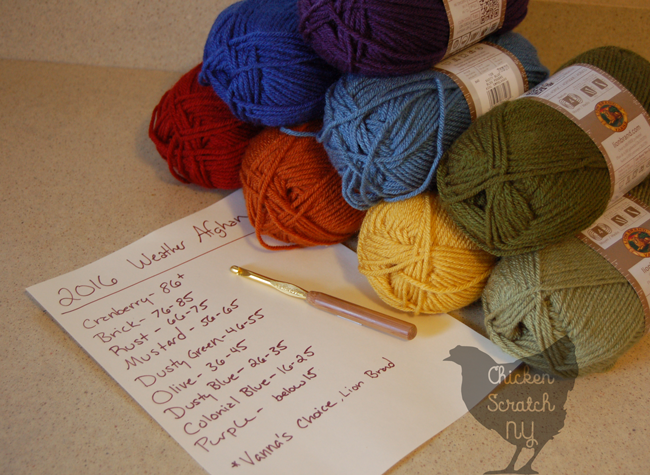 The hardest part of picking your yarn is going to be finding a line with a large enough variation in colors. If you aren’t feeling the Vanna’s Choice Redheart Super Saver comes in about 6 million shades. My original plan was to go with a more subtle cream/brown/green color scheme but I couldn’t get enough colors. If you pay attention carefully you might notice that I only have 8 colors, my local store was out of Cranberry so I couldn’t pick one up. I think I’m going to be ok though, it probably won’t reach 86 any time this week although with this crazy non-winter we’ve been having you can never tell. Don’t worry about buying all of your yarn at once, at least not unless it’s a crazy good sale. 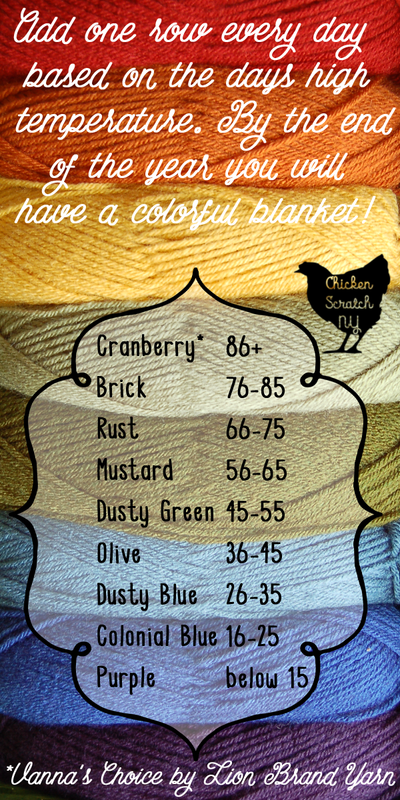 There’s no way to know what colors you’ll need the most of and with the variations in colors a slight change in dye lot won’t ruin your blanket. Joann’s and Michael’s bot h have huge yarn events constantly and even if they don’t you can always use coupons. A ball of yarn isn’t that much but when you need a bunch of them they add up fast. I was going to have this posted on the first but I wanted to have some amount of blanket completed so here we are on the 3rd and you can see two whole days! I’ve been using Weather Underground to keep track of my temperatures, they have an easily accessible history feature that lets you go back to days you’ve missed. Right now I have the colors I see in the immediate future stashed in a tote bag (purple, colonial blue, dusty blue and olive) with the rest in a bag in the closet hidden from tiny fingers and rambunctious felines. I used large index cards to track the temperatures and the corresponding colors. I personally find it much easier to work a full round of 4 sides at once. When I’m not carving out a few minutes for crocheting I’ll probably be playing sled dog for this little kid. 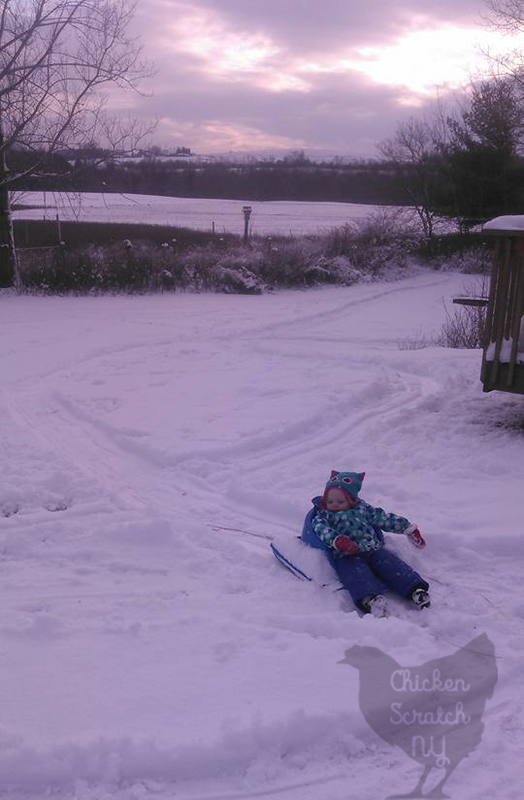 Do you have any winter projects planned? That’s such a cool idea! I’ve never heard of one being done like that, and there’s no pressure to get it done right away. Very neat! This is such a wonderful idea! Learning to crochet is on my to-do list this year and this might have to be a project I try as soon as I learn the basics! I have decided to make one of these. I seen your post and thought what a fantastic idea! love to crochet and this is a perfect 2016 project. I plan to do my in shades of green, blue and yellow – 9 colors. My plan is to do two complete rows per day. Living in Wisconsin our temps are cooler so my main color will be shades of green. I love this idea! I purchased some yarn for an afghan a couple of years ago and I have never done anything with it. I can see making this blanket while watching tv. Congrats on the new pregnancy and I hope you feel less tired soon. I have never learned how to crochet but was wanting to last month when I was trying to think of a way to make an ornament for my nephew. I found an old crochet book in my moms basement and was able to teach myself how to make the first row but that’s as far as I got. If I ever figure out how to crochet better I will definitely make these blankets, It would be interesting t see the weather changes each year. Some of my favorite blankets were hand made ones. I have no talent for making my own but I cherish the ones made for my family. My favorite blankets are my mom’s afgans she made us when we were little. I plan on working on a quilt for my husband and our yearly photo book. 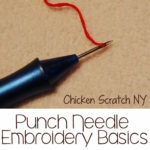 I saw you’re using the Vanna Choice yarn, which is what I used to start. When I did the math, though, two rows of granny stitch equals 1 1/2 inches; multiplied out by days of the year, I found out that my afghan will be very large. I’m disappointed but I’m thinking of looking for a thinner yarn. I’m considering splitting it into two blankets, I’ll have to see where I end up by the end of June. I have a king sized bed so I’m not opposed to a giant blanket but I’m thinking I might be spending my kids college fund on yarn! Do you have any pics you can share of how it turned out?